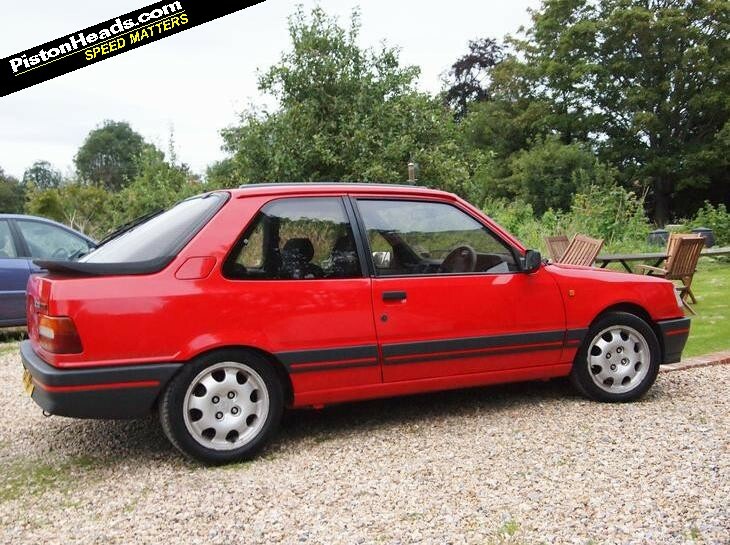 The 309 GTI isn't a looker, but who cares when its so good to drive? Being honest, this didn't take a lot of searching. Sure, it's nice to have a Spotted that reminds everyone the Peugeot 208 GTI will soon arrive, continuing the French firm's hot hatch legacy, but 309s would have been looked at regardless. The fondness for 309s comes simply from the fact that it's largely forgotten about in Peugeot's illustrious hot hatch back catalogue. Cars like the S1 106 Rallye and 306 GTI-6 remain coveted as a pair of the very best quick hatchbacks, and deservedly so. 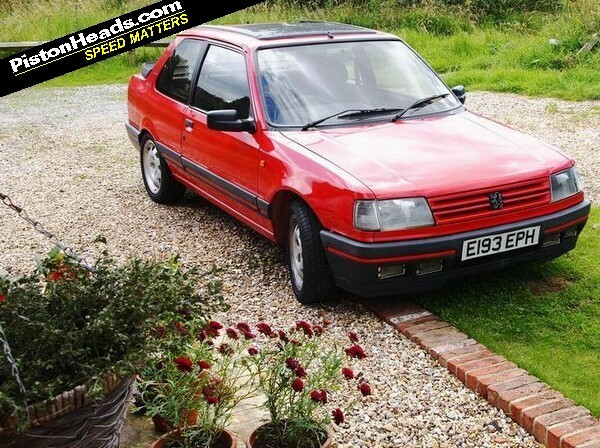 Prices for the 205 GTI are soaring. 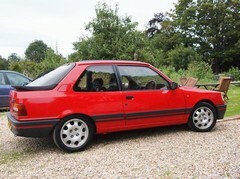 And yet the 309 GTI, which shares the components with the 205, rarely gets its due attention and values reflect this. The reason is simple; compared to the pert and petite 205, the 309 was a bit of a munter. The shape was (and is) rather blocky and it lacks the cute cohesiveness of the smaller hatch. But in 2012 it looks refreshingly unpretentious to these eyes and the GTI touches (wheels, foglights, bumpers) lift the shape suitably. Alright, the 309 won't ever be one of Peugeot's great masterpieces but a GTI should be all about the driving, shouldn't it? And speaking of driving, some argue the 309 is actually a more enjoyable steer than the 205 thanks to more favourable weight distribution. That boxier body allows the weight to be spread around more evenly, meaning greater neutrality and a reduced tendency for snap lift-off oversteer. Either way, a 309 will still be great. I've wanted one for ages (I have a model in exactly the same colour! )and this Spotted is possibly the best example you could find. Not only is it hugely desirable in terms of spec (a three-door, first-gen car in Cherry Red), it also appears to have been meticulously owned throughout its 25-year life. Grab a drink before you embark on the original ad, it's quite read. Dr Walker, who bought this GTI new in 1987, owned it for longer than I've been alive (!) and sold it on to the mechanic who had serviced it. The current proprietor has ensured the car has wanted for nothing. Though completely standard, this GTI has been treated to the best components; Ferodo pads, Helix oil, OEM suspension and exhaust parts. The advert makes for wonderful reading and there seems no reason to doubt the fastidious care seemingly lavished upon this little hatch. The vendor's enthusiasm is contagious, and it's only the Somerset location that is preventing me handing over the required cash and fulfilling my 309 GTI dream. Nothing to distract you from driving in here! Ah yes, the cash. 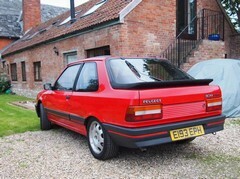 309 GTI values simply can't hold a candle to those of the 205. This stunning GTI will cost you just £1,750. That makes it surely bargain of the century. I like that alot. 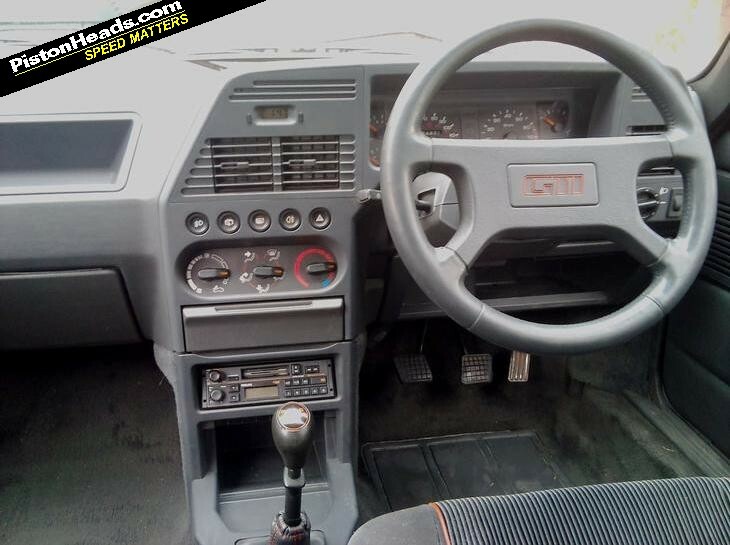 £1750 seems a very decent price for a car that looks in remarkable condition. That's a proper 80s dashboard! Never been a fan of that era peugeots, but I can appreciate a good condition bargain when I see one! 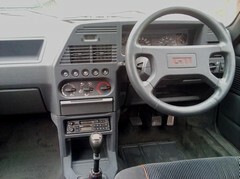 My first car way back in 1999 was an E reg 309 GTi... I was 17, just passed my test and found one for £600 locally. It was exactly the same as that, in fact I had to do a double take there. I absolutely loved it (so did my insurer at 17!) Compared to everything my mates had, it was stupidly fast, went round corners like nothing else and despite being made from recycled telephones and tissue paper, it was surprisingly bombproof. I lowered mine, put some sticky tyres and a Mongoose back box and continued to drive it and thanks to the baffle int he tank parting company and the tank design, which when low on fuel and being driven at pace round a right hander would make the fuel slosh over the 'hump' and that would run the pump dry and massive lift off spec oversteer would follow. Well, that's what the Peugeot mechanical told me and I'm sticking to that. It obviously had nothing to do with hugely ambitious cornering speed and unforgiving suspenion. Sadly mine started dying about 6 months in. Being 17 and full testosterone, I thought it wise to do a burnout one night which to be fair was rather epic. Sadly the internals of the box didn't age and fired the main shaft through the bell housing in 4 places (I still have it on my desk!) and that was the beginning of the end. I changed the box then the bottom end started knocking. A 'mate' figured he could build a mega spec engine using a Citreon XM 2.0 bottom end and an Mi16 top end which in theory was brilliant, but in practice it just never worked and never ran well. Being 17 and a bit broke and ignorant to engines, I lost heart and by this stage I was on a mission to buy a Cavalier GSi2000 instead. I left it with him and forgot about it (stupidly) It then sat in the corner of his yard for about 2 years, getting steadily worse then disappeared. He moved on, we never spoke again but I went back over a couple of years later and it was abandoned in a makeshift scrapyard on an adjacent farm. Poor old thing. A year or so later I was passing and looked in again and it was gone. And that was the end of E21 HSN. Superb cars, I used to have one and was gutted to see it go. I genuinely think these are better looking than it's sibling the 205, £1750 you say? Hmmmm.....tempting. Funnily enough I was looking at this advert last night thinking it looked in pretty good nick. Always liked the 309 gti. My Dad had a white one many, many moons ago. Have been browsing for decent examples of these for a while and most have been butchered or destroyed. If somebody made me a decent offer on my car I think I might just go and buy that one tomorrow. Proper hot hatch. This has put a smile on my face, as as much as I want to keep the thing I am off University soon and it needs to go soon. And isn't the rear window like rocking horse pooh to get a replacement for? I saw a white one of these on my way to work a month or so back. Rally car though, had a cage, mud flaps and the Peugeot sport stripes. Made me realise you simply don't see these any more! Maybe, but when would you need a replacement rear windshield? Beauty is in the eye of the beholder, and as far as '80s cars go, I don't think this looks that bad. I was searching for adverts for these recently. There were hardly any for sale! I think I found 2-4 across PH, AT and eBay. That dash pic takes me back... 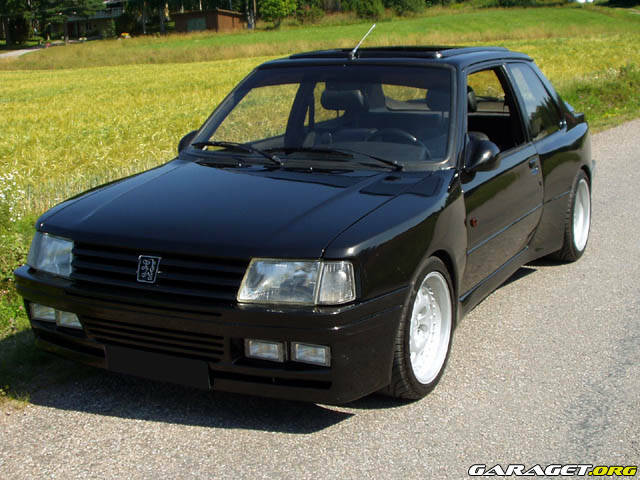 Loved my phase 2, thought it was a better drive than the 205 1.9 gti I had prior.. Wife hated the 309 though so it had to go.. This remains the ONLY car I've ever declined purely because the interior was utterly and totally HATEFUL. I can live with ugly exteriors - as people say, you can't see it when you're driving it, but that interior is HIDEOUS. It's not just the 'slab' looks - the plastic quality made a 205 feel like a Jaguar (and they were pretty basic) - my 405 is more like a Rolls in comparison! 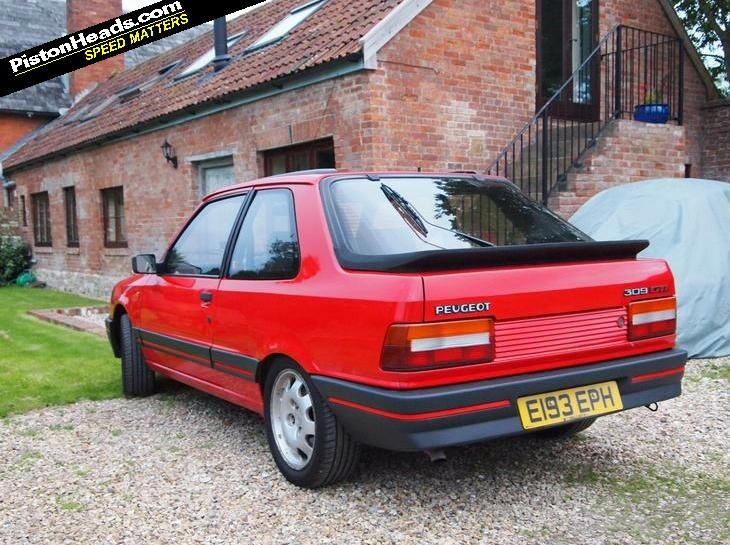 I didn't know they did one of those - that's not bad really, looks like a slightly fatter/longer 205! The facelift models are much nicer looking and I'd have one over a 205 all day long. There's s reason people use the 309 rear beam on the 205, it's s much better drive.